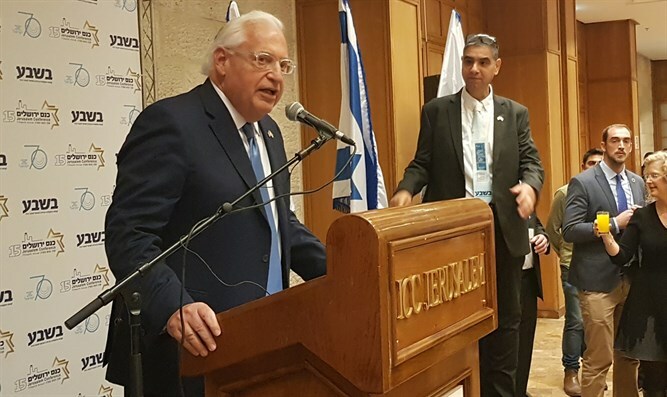 American Ambassador to Israel David Friedman addressed the opening gala of the 2018 Jerusalem Conference on Sunday. The conference, hosted by Besheva in the International Convention Center in Jerusalem, has been held every year since 2004, and brings together policy-makers and other Israeli leaders for discussions on the top issues facing the State of Israel. On Sunday, Besheva held a special gala ahead of the conference, slated for Monday and Tuesday. Speaking at the opening gala, Ambassador Friedman hailed President Donald Trump’s December 6th declaration recognizing Jerusalem as Israel’s capital, and the administration’s Israel Independence Day celebration last year – the first ever held at the White House. “For the 70th anniversary of the State of Israel, I can’t help but think back to how I celebrated the 69th anniversary of the State of Israel. It was my pleasure for the last anniversary to be the master of ceremonies at the very first Yom Haatzmaut [Independence Day] ceremony ever held at the White House. “We have turned the page with regard to the United States’ relationship with Israel from that 69th Yom Haatzmaut celebration in the White House, we moved ahead to Yom Yerushalayim [Jerusalem Day]. I was the first US Ambassador to celebrate an [event] for Yom Yerushalayim. The very next day, President Trump became the first sitting president in history to visit the Kotel Hamaaravi [the Western Wall]. Trump’s election, Friedman said, had brought about an “incredible change” in the US-Israel alliance. The ambassador also touched upon Israel’s recent clashes with Syrian and Iranian forces, which resulted in the downing of an Israeli F-16I “Sufa” fighter jet and the destruction of a Syrian military command and control center, leaving at least six dead.